Casablanca is a lovely, very private, two bedroom, two bathroom unit that sleeps 4. The Main En-Suite Bedroom has a Queen sized bed and Built In Cupboards, with a shower, basin and toilet, a linen cupboard and sliding doors opening onto the balcony. The Second Bedroom has two single beds, and Built In Cupboards. The second bathroom has a bath, basin and toilet. Linen is provided but please remember to bring your own bath and beach towels. Our beautiful kitchen has granite tops and cherry wood cupboards, and is equipped with a Bauer oven, extractor fan, washing machine, fridge/freezer, microwave, toaster, kettle, cooking utensils, etc. The Flat is fully furnished and includes Full DSTV (activated upon request), a DVD player, and fans. The Lounge Sliding Doors open onto the balcony which overlooks the complex pool and garden. The unit has a tandem garage to accommodate two cars. 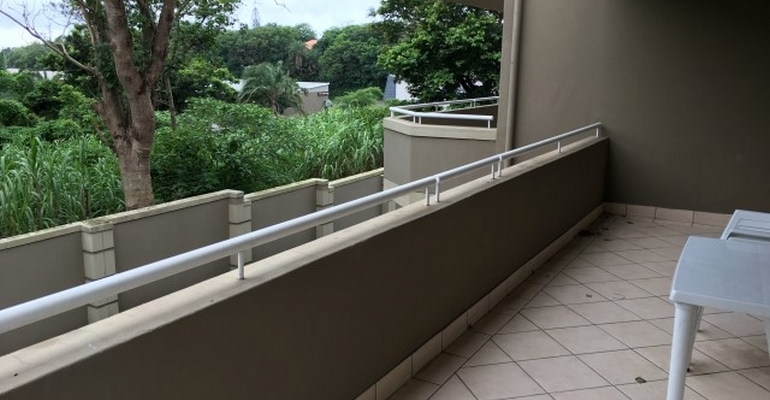 The complex also offers a communal braai area, electric fencing, and automated gate. We are close to all amenities, including the Main, Blue Flag Bathing beach- home to the ever popular Blue Lagoon Restaurant, and many summer-fun memories. Shops are within walking distance and there is quick access to other beaches, restaurants, shopping malls, etc. Regret- No Smoking in the unit, Please.